How cute is he? So glad you had all your little chicks around you. I had a nice day, too. I hope if I ever come to visit that you'll make me pepperoni rolls. I'll sit in the kitchen and keep you company while you do. Deal? What a lovely post to read this Monday morning. 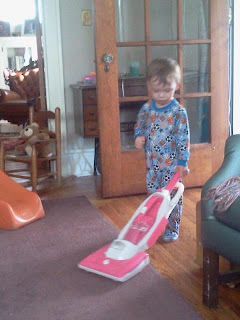 Love the idea of buying the vacuum for the little guy - but hear you about the pink, sort of sexist, right? So glad you enjoyed your Mother's Day! Absolutely IS a deal. Stop and grab Bob and Susan on your way through! It will be a pepperoni party. Dear Lord! 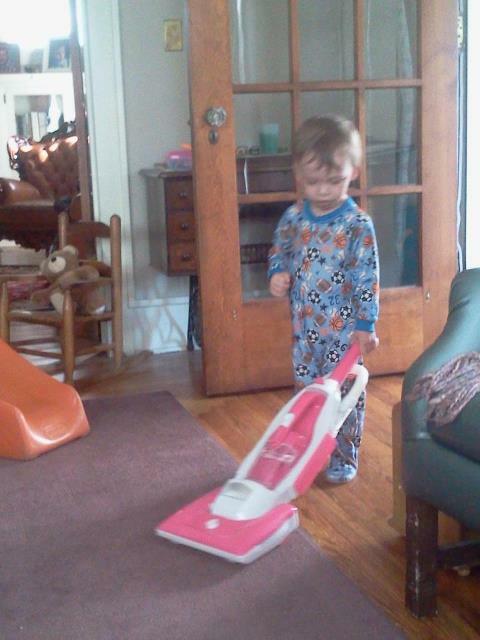 A kid that likes vacuuming and shopping?? Get that boy a strong male role model, STAT! I'm not huge into assigning specific gender identities (hey, if a boy wants an Easy-Bake Oven who am I to judge?). But please! Couldn't you have bought him the vacuum *AND* a truck? I mean, what's next? Is he gonna put on a black leotard and dance around to Beyonce's "Single Ladies" video? I'd be worried. Dr. Barbanes Prescribes: A full day of watching John Wayne movies, some WWE wrestling and monster truck racing. And maybe some Monday Night Football as well before going night-night. Oh wait- scratch that last - we need to find something *less* gay for him to watch than professional football. ...Aaaand WWE wrestling too for that matter. AAAARRRGGHHHH! Deep cleansing breaths Bob. It will be okay...he also likes fishing, Thomas the Train, and Spiderman, and everything becomes a truck. He makes very manly motor noises. He helps Gompa fix things. By this I mean Gompa spends a lot of time trying to figure out where William took one tool or another.